The Japan Video Software Association (JVA) has revealed that the net worth of the home video market fell by 12.68 billion yen between 2016 and 2015. There is some bad news for Japan’s home video industry. 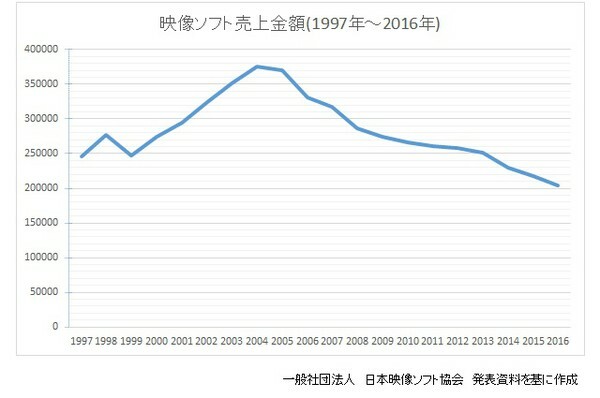 2016’s market was worth 204.47 billion yen and continues the long downward trend. Home video sales in Japan has been falling since 2004, and show no signs of bouncing back. The JVA lumped every disc sale and rental into a single category, but anime creators have been talking about how a series’ success being tied to the home video market is a losing strategy. In 2015, producer Marina Sasaki (producer of Parasyte -the maxim-) went on a rant citing that most anime will never get additional seasons because home video sales are too low. In 2016, anime director Yutaka Yamamoto (Lucky Star) and ex-President of Gainax Toshio Okada went a step further and blamed the old fashioned mentality of production committees for harming the industry. Home video distributors, like Pony Canyon, tend to be on production committees, which forces studios to worry about disc sales. In Japan, a typical anime series can cost around $300 once you purchased every bit-sized volume. Marina Sasaki said this is the primary reason for fans avoiding home video releases. While the falling home video market seems like the apocalypse since they depend heavily on its sales, it’s not all bad news for anime. The industry itself has been growing over the past 5 years, thanks to international licensing, live-action movie adaptations, and merchandising.